The Postal Service delivered around 14 billion bills to Americans last year, representing more than 75% of all household bills sent (the rest were delivered electronically). Conversely, when it came time to pay these bills, only 33% of household bill payments were returned through the Postal Service. While bill payment by mail has steadily declined in recent years, why have we not witnessed the same effect to the bill delivery market? Since the late 1990s, InfoTrends has been monitoring the shift from paper to electronic delivery of transactional communications, which include bills, statements, legal notices and other critical messages. We conduct an annual survey of 250 businesses and 2,000 consumers in the United States to understand the changing market dynamics. 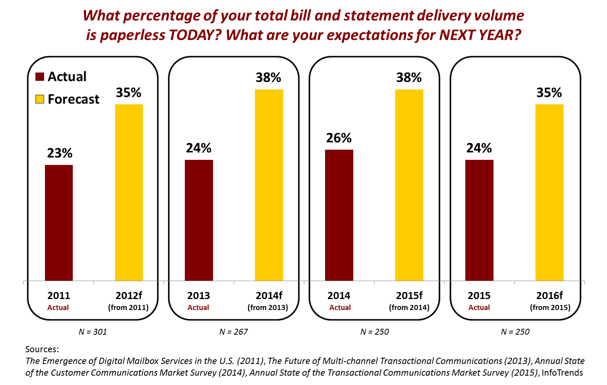 This year, the average paperless push delivery rate reported by businesses for bills and statements was 24%. What makes this statistic particularly interesting is that it is the same percentage reported in 2013, whereas the average in 2014 was 26% paperless. While we do not expect that there was actually a decline in paperless adoption year-over-year (since the two percent difference is within the margin of error for a survey of that size), these results certainly speak to minimal growth. Despite this apparent lack of growth, business respondents repeatedly overestimate growth in paperless delivery for the following year, as shown in Figure 1. What is curious in their approach is that these same respondents (who missed their adoption targets) are falling right back into aggressive expectations for growth next year. Did their compliance concerns change? Has their interpretation of regulations within their industry changed? Are they improving the workflow and customer experience to make it easier on their customers? These three reasons for missed adoption targets were also the top responses last year. That tells me that these responses may serve as a crutch for businesses that want to have it both ways—they want to drive significant growth in paperless delivery adoption next year but want to have the fallback of deflecting blame when employing the same strategy, which they have used for the past five years, yields little progress. With more than half of the businesses we surveyed this year saying that postage rate hikes would create more pressure to increase paperless delivery, it will be important for businesses to temper their growth expectations—absent a transformational approach. While reducing print and mail spend is a primary driver for businesses to push customers toward paperless delivery, consumers are not driven by the same incentives. Our consumer research focuses on Americans with household access to the Internet—where online bill presentment and payment is an option—and only 10% of our respondents said that they access none (zero percent) of their bills or statements online. Yet, only nine percent of our respondents say that they are completely paperless for the bills and statements they access online. This leaves a significant population in the middle that receives the paper document but also have electronic access. We call these consumers “double dippers.” When we ask these respondents why they continue to embrace the paper version, their top responses are tied as to why they value paper. 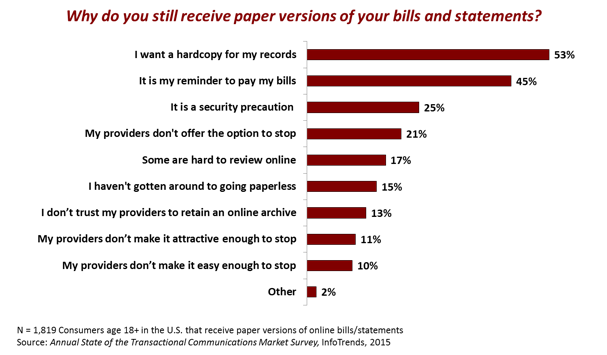 Notably, consumers want the hard copy for their records and they also note that the paper bill serves as their reminder to pay, as shown in Figure 2. Lesser reasons for not parting with print and mail included that providers don’t offer the option (21%), consumer inertia relative to taking the action to go paperless (15%) and lastly—one of the top reasons that businesses cited—that the providers are not making it easy enough to stop receiving paper (10%). Clearly, there remains a disconnect between senders and recipients, and the solution is not to make it easier for customers to sign up to go paperless. Achieving significant growth in adoption rates for delivery of transactional communications will require transformative approaches to the business problem. 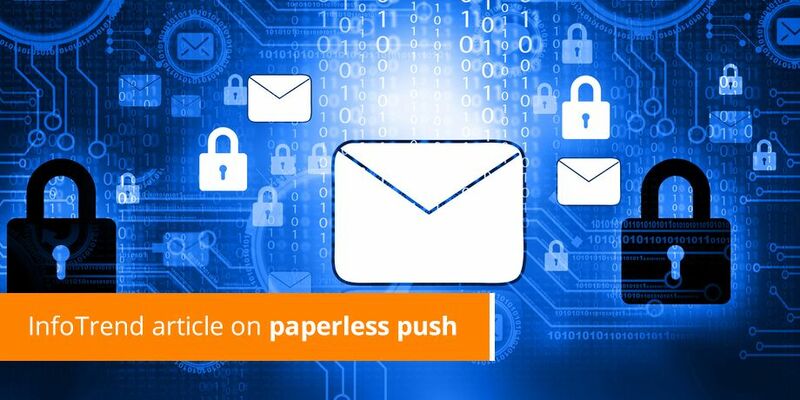 How will you transform your approach to increasing paperless delivery? In the meantime, you might want to re-evaluate your expectations for paperless delivery adoption growth in 2016. InfoTrends, a worldwide market research and strategic consulting firm for the digital imaging and document solutions industry. 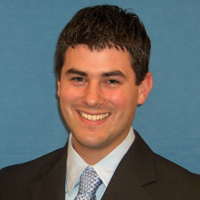 He is responsible for driving global research and consulting initiatives in the customer communications and document outsourcing markets.